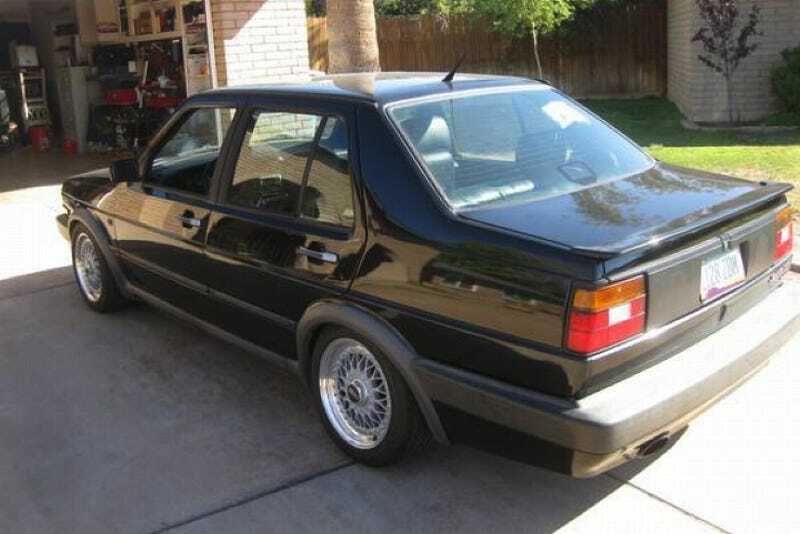 For $7,000, This Jetta’s A Syncro, Yo! While Jetta Syncro may sound like the name of a video game hero, it’s actually that of today’s Nice Price or Crack Pipe custom Vee Dub. The question is, will it price have you using some less pleasant names for its seller? Here in America we like us some trunks. Not the elephant kind mind you, but those on the back ends of cars to make us feel all important and stuff. That affinity for three-box cars over hatchbacks is what led Volkswagen’s second-generation (A2) Jetta to become America’s best-selling European car back in the day, as well as outselling its trunkless twin, the Golf, by more than two to one. That mk 2 Jetta is also noteworthy for both being the longest produced of any Jetta model, and for being the first VW built in China, where in 1991 the cars were assembled from complete knockdown kits just like so much Ikea furniture- Jê-tā. But today we’re not so much interested in all the things the A2 Jetta was as we are in what it wasn’t, at least here in the U.S.. Let’s look at the list, m’kay? The mk2 wasn’t available with a VR6 engine. Nor could you buy it with Volkswagen’s Sycro AWD system. And, you most certainly, absolutely, definitely, unequivocally could not buy one with a Corrado dashboard, even though you know that’s what the Jetta buying public craved. 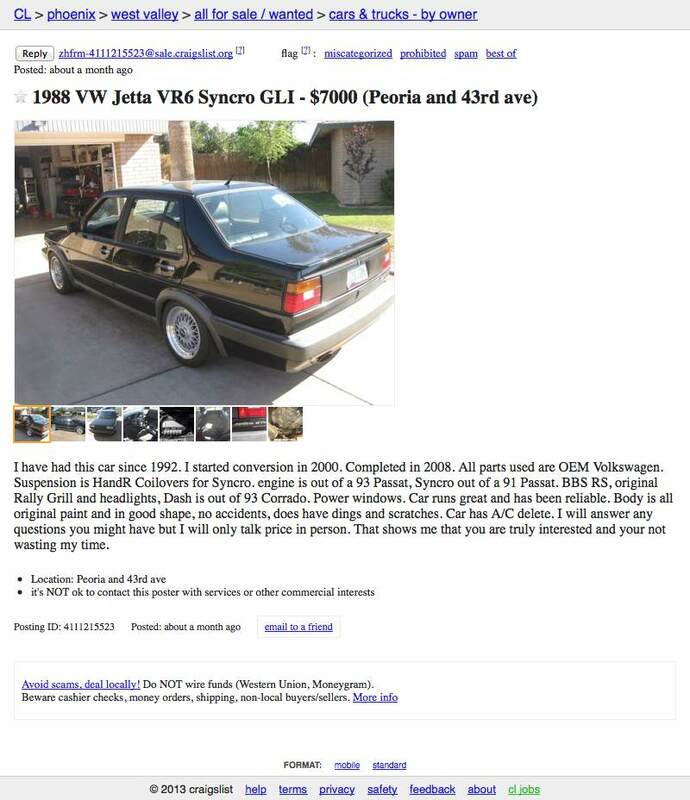 This 1988 VW Jetta GLI sedan has apparently been the personal project of its present owner since 2000. From the tail end, it looks pretty Jettariffic, but move around to the front and you will note a set of headlamps and accompanying grille from the homologation Rallye Golf. That’s all kinds of cool looking and brings home the point that many VWs - like twin sisters - have the ability to share forms and functions like nobody’s business. Under the hood is where that fact becomes evident as the GLI’s four has been replaced by a 2.8 VR6 out of a 1993 Passat. BTW - I’ve always loved the name of that slightly larger VW, just so I could say passat gas. Yes, I’m weird. Here, the narrow-angle dangle of a six is backed up by a 5-speed stick, which if my experience is anything to go by, will be clunky to operate. No surprises there. What you will find surprising however is the Syncro drivetrain, also late of a Passat, just this time a ’91. The we are fam-il-y doesn’t stop there either because popping a door reveals that the mk 2’s rectilinear dashboard has been given the heave-ho in favor of a rounder one from a later Corrado. Aside from some hinkey under-dash wiring it looks like a pretty decent fit, and the rest of the GLI interior pieces seem to have either held up well or have been replaced since new. On the outside a set of real deal BBS baskets add some bling to the somber black bodywork, and while the Rallye Golf’s flared fevers didn’t join the grille and lights in Jetta joining, the clean lines of the stock car still look good today. The paint seems reasonable, and the ad notes only minor dings and dents, which are to be expected. Unexpected may be the price, which is a requested $7,000.Seeing the mods that Jetta owners usually make to these cars, the fact that this one is claimed to be made from VW OEM parts is noteworthy and laudable. The question is do they add up to the car being worth that seven grand? What do you think, is this cool AWD VR6 mk 2 worth that kind of scratch? Or, for that kind of dough, would you rather just go buy an old Audi? Phoenix Craigslist, or go here if the ad disappears. H/T to Grant Scott for the hookup!